Top up Loan Vs Personal Loan - What should you choose and Why? Home » Home Loan » Top up Loan Vs Personal Loan – What should you choose and Why? What is Top Up Loan? Why should you consider Top up Loan? Let’s take a look. People generally opt for a personal loan to fulfill their cash requirement in an emergency. It is quick and easy loan option nowadays. However, before taking any loan one must understand, which loan is best for them? My friend had purchased a flat by taking a home loan before 3 years. He started paying EMI’s for the same. After 3 years he got an additional requirement of 3 Lakh for his daughter’s marriage. He could not manage cash and the only option left to him is taking another loan. He approached the bank from where he has taken a home loan. The bank manager gave him two options (1) Personal loan (2) Top up Loan. He is confused and looking for an answer which one he should take a personal loan or top up loan? If you are in a similar situation here is a quick guide explaining about Top up Loan and Personal Loan. Top-Up Loan as the name suggests it is a loan given on the Top of another loan – Home Loan. That’s why it is also known as a Top Up Home Loan. Top-Up Home loan is offered to existing home loan customers. Almost all banks including Non-Banking Finance companies (NFBCs) offers Top up Loan. Terms condition, interest rate and tenure of this loan differ from bank to bank. You need to have a very good credit history in order to take this loan. There is a common misconception that Top up Home loan is given only for house renovation or for additional construction. However, it is not true. Most of the bank offers Top up loans which can be used for any purpose including medical expense, marriage, business expense, child’s education etc. You should be existing home loan customer of the bank or NFBC. You should be holding very good repayment record for few years. You should not have exhausted your home loan limit. Your Credit score should be good. If above conditions are satisfied banks generally sanction top-up home loan in maximum 2 days’ time. Note – Eligibility conditions for this type of loan may vary from bank to bank. You should talk to your bank/NFBC to find out further details. Top Up Home loans does not require any type of additional collateral. You need not provide any documents/evidence of holding an additional asset for availing this loan. Your home loan agreement/paper will act as a collateral. The interest rates charged on Top-Up Home Loans are 1% – 3% higher than a home loan interest rate. This means you will get Top Up Home loan at the interest rate of 11% -14%. At the first glance this cost seems to be high but if we compare it with a personal loan it is low. Loan amount in the case of a top-up home loan will be limited to your sanction home loan amount/outstanding balance. In some cases, a bank may give additional loan amount sanction, it all depends upon your credit history and property rates where you have purchased a property. The approval amount will be higher if a top-up loan is applied after 3-4 years of availing home loan. Tenure of top-up loans is 10 years or 15 years. It can go up to 20 years based on your existing home loan tenure. It generally takes 2 days to get an approval of this loan. Bank usually check repayment history and repayment capacity of the borrower before approving the loan. Some banks restrict top-up home loan for home extension only. However, most of the bank has removed this restriction. You can avail top-up home loan for any purpose like children education, medical emergency, home renovation, marriage, business expense etc. You can avail tax benefit provided you have used top up loan amount for renovation, acquisition or construction of existing home. After understanding the concept of Top Up Home loan. 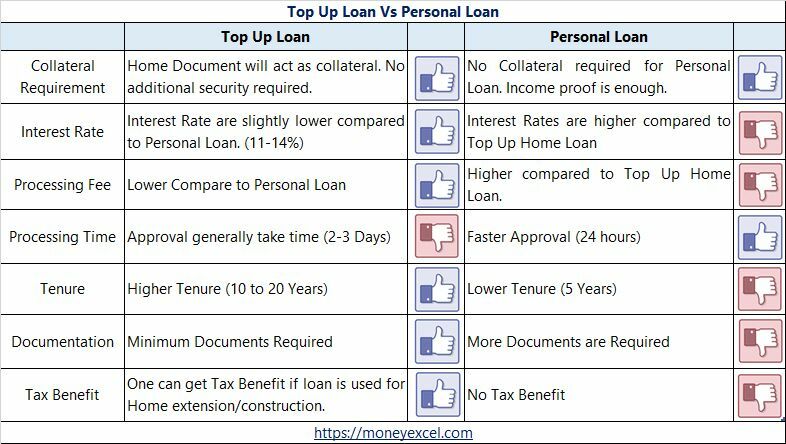 Let’s compare Top Up Loan and Personal Loan. I hope by now you must have got a fair understanding of top-up loans and personal loans. Top up Loan offers multiple advantages compared to personal loans. If you have an existing home loan with a lender and a choice is given to you between a personal loan and top up loan you must select top-up loan as it offers benefits like lower interest rate, higher tenure, lower EMI and minimum documentation. If you don’t have a home loan you can think of taking a personal loan, gold loan or loan against a fixed deposit. Make sure to do proper research before taking any loan.